I think every parent will tell you they were unprepared for both the difficulty and joy that being a parent would bring to their life. I have 5 kids and I am a big proponent of parenthood, but let’s be honest– It is not all sunshine and roses. I saw something on Facebook the other day where people were offering some of their crazy experiences as parents and saying basically if you like this, then parenthood is for you. There were some pretty hilarious things on there. I’m still trying to find it again so I can link to it here for you to enjoy as well. But, I thought I would share my own list from my experience as a parent. 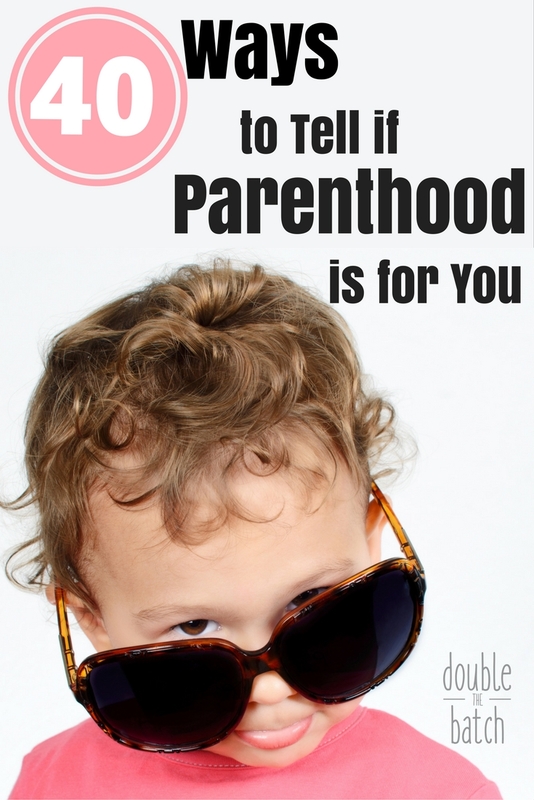 Here are 40 ways to tell if parenthood is for you. If you like large doses of less than constructive criticism about every meal you make, then parenthood is for you. If you enjoy long discussions with unreasonable people about why sugar should not be the most stationary part of their diet, then parenthood is for you. If you like to have someone giving everyone else in the public restroom a play-by-play of your elimination process, then parenthood is for you. If you are good at hiding candy, then parenthood is for you. If you look at sleep as optional, then parenthood is for you. If you just can’t get enough of Elmo’s theme song, then parenthood is for you. If you find fickleness charming when it comes to clothes, food, and the color of sippy cups, then parenthood is for you. If you find you work more efficiently with multiple interruptions, then parenthood is for you. If you enjoy playing hide-and-seek with sippy cups, pacifiers, and shoes, then parenthood is for you. If you are really good at saying the word “what” and don’t care at all if you ever get an answer, then parenthood is for you. If you view spending more time cleaning other people’s noses and bums than your own as a character building challenge, then parenthood is for you. If you have tons of money lying around and have no idea what to do with it, then parenthood is for you. If you like getting eaten by mosquitoes while watching what looks like a swarm of mosquitoes in jerseys kicking a soccer ball, then parenthood is for you. If you like being pummeled with questions by several people all at the same time, then parenthood is for you. If listening to high-pitched screams in the confinement of a car brings peace and joy to your heart, then parenthood is for you. If hot-n-ready pizza and taco Tuesdays are already a main staple in your diet, then parenthood is for you. If you enjoy listening to very detailed summaries of animated movies and feigning interest, then parenthood is for you. If you enjoy abstract art and are open to the use of Sharpie and excrement for mural-ling on your walls, then parenthood is for you. If you wouldn’t get embarrassed by a little naked human running around your front yard, then parenthood is for you. If you like answering questions in rapid succession, then parenthood is for you. If you like catching other people’s vomit while you are sick, then parenthood is for you. If you think if a joke is funny once, it is funny 100 hundred times… in the same day, then parenthood is for you. If, to you, clutter just feels cozy, then parenthood is for you. If you can strategize like an NFL coach when it comes to protecting all the nice things in your house, then parenthood is for you. If you like spending time in the car and buying gas, then parenthood is for you. If you have really missed those 5th grade story problems, then parenthood is for you. If you enjoy sharing your bed with someone who insists on sleeping perpendicular to you and repeatedly kicking you in the crotch all night, then parenthood is for you. If you want to discover the magic and wonder of this world all over again, then parenthood is for you. If you like big, squeezy hugs and butterfly kisses, then parenthood is for you. If you’ve always wanted to be somebody’s hero, then parenthood is for you. If you enjoy feeling needed and adored, then parenthood is for you. If you like free entertainment, then parenthood is for you. If you want to learn some of the most valuable lesson life has to offer, then parenthood is for you. If you want to feel real purpose in your life, then parenthood is for you. If you want to have reasons to laugh on a daily basis, then parenthood is for you. If you want to make a difference in this world, then parenthood is for you. If you want to change your life forever in really great ways, then parenthood is for you. If you want someone to pass on all your wisdom to, then parenthood is for you. If you want to learn intense lessons in selflessness, humility, patience, and charity that will make you a better person, then parenthood is for you. And if you want to see how close your heart can come to exploding with love for another human being, then parenthood is for you.